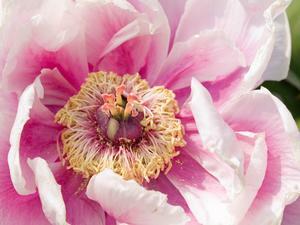 Peonies are hardy perennials, valued for their form, variety of color and ease of cultivation. Colors range from white, cream or yellow, to pink, rose and brilliant scarlet. Attractive foliage remains after spring blooming, which makes the peony a fine accent plant for the shrub border. If planted close together, peonies can also form a striking hedge to separate the lawn from a driveway or path. Peonies look good against around foundations but may need additional watering if this location is dry. Plant peonies at least two feet away from the wall to allow for full growth. My peony buds start to grow in spring, but they stay very tiny and die. What’s wrong? This is a condition called “bud blast” that can occur in newly planted peonies. The flower buds grow about the size of a small pea but then stop growing and fail to open. Peony plants form their buds in the fall. A clump that’s been divided has a much-reduced root system, and it sometimes doesn’t have the strength to develop all its buds. This problem goes away as the plant matures. In more mature plants, possible causes include poor soil fertility, too much shade, dry spells or cold injury after an extreme winter. Winters that are colder than normal and late spring frosts can abort the buds of mature as well as new plants. The best remedy is to protect peony clumps with winter mulch (fall leaves or Christmas tree boughs work well) applied in late fall or early winter after you have cut down the previous season’s foliage. Some stems on my peony suddenly wilted, turned brown and dried up. What’s wrong? My plants have been in the same spot for years, but now they aren’t blooming as well as they used to. Generally, peonies grow well for many seasons, as long as they have humus-rich soil, adequate moisture and full sun. However, if your plants have been in the same spot for years, the soil may be depleted. Mulching them each spring and fall with a couple of shovels full of well-rotted manure or garden compost can help. If your plants are getting crowded or are now shaded by surrounding trees and shrubs, consider dividing or moving them. The best time to do this is in late summer or early fall. Cut into the fleshy roots to make divisions that have at least four or five eyes (the little buds you see on the roots). Replant into enriched soil and make sure the eyes are set no deeper than two inches. Peonies need moist, rich soil in full sunlight or light shade. Dig a planting hole of 8 to 10 inches deep, three feet away from other plants, placing the eyes (buds) no more than two inches below the surface. Peonies set deeper than this may produce lush foliage but fail to bloom satisfactorily. If your soil is poor, dig a hole two feet deep and two feet wide, filling with good-quality topsoil before planting the peony root. Peonies are heavy feeders. Work two tablespoons of 5-10-5 fertilizer into the soil around each plant in fall or early spring. Alternatively, amend the soil around the plant by applying one to two inches of well-rotted manure or compost taking care to keep the manure well away from the plant stems. Taller peony varieties and those with double flowers usually need staking. Wire hoops attached to three or four stakes should be set out in early spring, to circle and support the plant as it grows larger. Commercial peony stakes are also readily available. Cut peony blooms as soon as the outer petals unfold for use in bouquets. Place stems in a container of water as soon as they are cut, then snip the stems again under water to promote long-lasting cut flowers. As flowering comes to an end, remove any spent blossoms by cutting the stem level with the plant’s foliage. , most garden peonies are hybrids of Paeonia officinalis and P.lactifora which can be grouped into four categories by the shape of their flowers. Single peonies have a ring of 5 or more petals with a central ring of stamens…Japanese peonies have a ring of petals around a central cluster of modified stamens that are narrow and flat and bear no pollen….Semidouble peonies have several rings of petals around visible stamens. Double peonies have many concentric rings of petals and no visible stamens. Creating a Japanese form, ‘Tom Eckhardt’ features deep rose-pink flowers with enlarged golden yellow stamens. Fragrant blooms appear mid-season. Height: 30-32″ Width: 2-3′ Blooms: Pink (Spring) Hardy in zones 3-9 The plant you will receive is growing in a 5″ pot and well established. Paeonia (Lactiflora hybr.) ‘Lotus Queen’ has single, pure white flowers with yellow staminodes. Fragrant, showy flowers. Height: 35″. Hardy in zones 3-8. Blooms May-June. Double pink, very fragrant, 5-7″ flowers with a touch of white. Blooms: late spring or early summer. Long lasting cut flowers; plant as a short hedge or in small groups. Large, 3-5 eye plants, hardy in zones 3-9. Height 26-34″. Huge, bright scarlet, ruffled satin-like flowers. Top quality, extra hardy year old plants. Growing only 4 to 5 feet tall, these exceptional tree peonies are sub-zero hardy and bloom for a lifetime. When old, established peony clumps become too crowded, flowering may be reduced and the roots should be divided. In September, cut the stems near ground level and dig the roots carefully with a spading fork. Shake the roots to remove loose soil and then wash off most of the soil. Washing the soil away helps you to locate natural crown cleavage areas so that less of the fleshy roots are lost while dividing the clumps. Each division should have three to five healthy eyes (buds) attached to three or four thick roots. A husky division of an old peony plant should not be expected to flower the first year after planting. In fact, it is advisable to nip off any flower buds that appear the first year to permit the plant to develop its root system during the first year of growth. During the second year your plants may be permitted to flower. By the third and fourth years, the plants should give excellent blooms. Healthy peonies in fertile soil may bloom for as long as 50 years.